When I came to Japan and started a blog about Japanese shoegaze music, I almost immediately found the Kansai scene to be the most accessible. I have fond memories of a bunch of bands who were not only really welcoming but also supportive of the blog and zine, especially bands like Lemon’s Chair and Ether Feels. The Japan Shoegazer Festival in Osaka was a very comfortable spot for me, and thanks to the bands and the community that grew around the event I was able to get to know some great folks and learn a lot about the Japanese shoegaze scene. One of the bands who really helped me out was Cigarette in your Bed. The band split time between Tokyo and Osaka, though around that time they seemingly played a bit more in Osaka. They were a staple of not only the Japan Shoegazer Festival (in both cities), but the frequently held High Fader Night at Club Vijon in Kitahorie as well. In addition to being cool dudes, Cigarette in your Bed’s music resonated with me instantly. Their style was really unique compared to a lot of what was going on in the Japanese shoegaze scene. The name conjures the image of a My Bloody Valentine knock-off, but they were far from that. They were far edgier than their peers, drawing as much influence from grunge and 90s alt rock as they did shoegaze. Their live show was dynamic and brutally loud. I’d made it a point to come down to Osaka to see them play whenever I could. Cigarette in your Bed has come quite a long way since then, releasing their debut full-length Darkness in 2014 via High Fader and playing some big shows, including opening for Astrobrite in 2015, while also starting an event of their own called “THE FUZZ”. 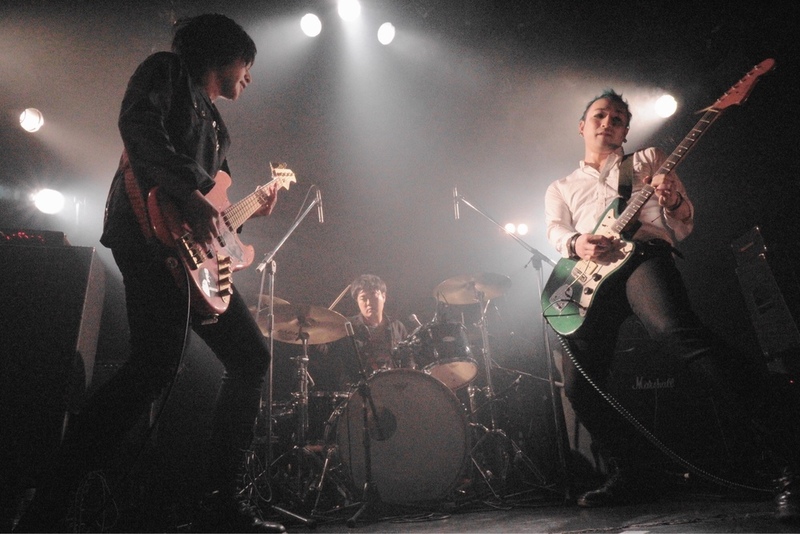 The band’s since moved on from their previous scene and found a new home in the Koenji hard rock scene, but with the release of their new Nothing E.P. they’ve shown a dedication to their core sound. The EP kicks off with “Nothing”, a track that plays like a straightforward rock song blanketed in quivering shoegaze guitars. The verses are decent enough, paced by a steady beat and frontman Kazuya Saijo’s simple vocals, but the song really takes off at the explosive chorus. The repetition of the vocals is pretty similar to “Let Me Out”, giving them an almost instrumental quality that’s secondary to the massive guitar buildup. “Ghost” is a three-phase track that cuts from a bendy guitar howl of an intro verse not too different from “Nothing” to an overdrive-heavy rehashing of the same. The song feels like three different variations of the same basic line, with the first part being more “gazey” and the second a bit more grunge-y with super distorted vocals. The track winds down in a sort of striped down version of the introduction. It’s a short track, but interesting enough in that the band basically demonstrates its range while never really changing the parts too much. Finally, “I Don’t Know” gets away from the intensity of the first few tracks, showing off the dreamier side of what Cigarette in your Bed can do. The song basically goes back and forth between a sweet-sounding, reverb-soaked verse and a sort of disorienting few measures of a chorus. The main part is really chilled out and comfy before the guitars spin out for a bit. One other noticeable part of the song that’s a bit different from their previous work and consistent throughout the EP is the complexity of the basslines. The band is showing some maturity with their new stuff, and it should sound even better once the production value picks up. Overall I’ve enjoyed the EP. It’s just three tracks and they’re pretty simple, but Cigarette in your Bed have always made some really great tracks with a simple approach. Unfortunately for fans of the band overseas it’s going to be tough to get your hands on this, but if you happen to be in the Tokyo or Osaka areas for one of their gigs it’s totally worth it for the show and the goods. There aren’t even any samples of the music online apart from a few brief clips the band has posted on its Twitter account. You can also buy some merch at their online store and purchase their debut album “Darkness” on Amazon. Here is a video of a live performance of “I Don’t Know” uploaded by Club Kinoto. The recorded version is better, but this will at least give you a bit of an idea. Enjoy! The 2014 Japan Shoegazer Festival kicks off in less than a week with the first event taking place in Osaka on September 7th. Between the two shows – the latter on the 27th in Tokyo – the bill is loaded with well-known artists in Japan’s shoegaze scene: Zeppet Store, cruyff in the bedroom, The Florist, cigarette in your bed, Plastic Girl in Closet, and of course Lemon’s Chair among others. Though the most impressive lineup in the event’s history will attract attention thanks in large part to these names, the bill sports some perhaps lesser known talent that is well worth watching. EUPHRATES is one such band, though Japan Shoegazer Festival devotees will certainly know the name. The Osaka-based four piece and member of Japanese shoegaze label High Fader Records frequents the middle of the festival’s lineups and remains quite active within its local music scene, planning and performing at events like “EUPHRATES Presents High Fader NIGHT”. Since forming in 2012, what name they may have made for themselves to date has been crafted with dreamy vocal melodies and explosive, at times danceable choruses. “Come With Me” is the ultra-catchy fan favorite at gigs, drawing the largest applauses and eliciting about as much movement as you’ll see at the Japan Shoegazer Festival. Having seen the growth of cigarette in your bed, another High Fader product, this year, it would seem that EUPHRATES are near the front of the line to emerge in the near future. To date they have no proper released material, but perhaps their two most recognizable songs can both be heard on the band’s Soundcloud page. Cigarette in your Bed have been a part of the Japan Shoegaze scene as it has been growing over the last few years. The trio released their debut LP Darkness earlier this month via shoegaze label High Fader Records (Lemon’s Chair, sugardrop, Yellow Loveless). They’ve been gigging alongside Lemon’s Chair, who released an album of their own in April and who are getting ready to re-release their much sough after debut. Cigarette in your Bed released a video for their first single “Let Me Out” and today announced that they will be shooting another for the album’s title track. The EP version of “Let Me Out” is available for free download as part of Muso Planet volume 4.